So cool, I love his layers! This layering is just perfect and his precise coiffed look is totally alluring! 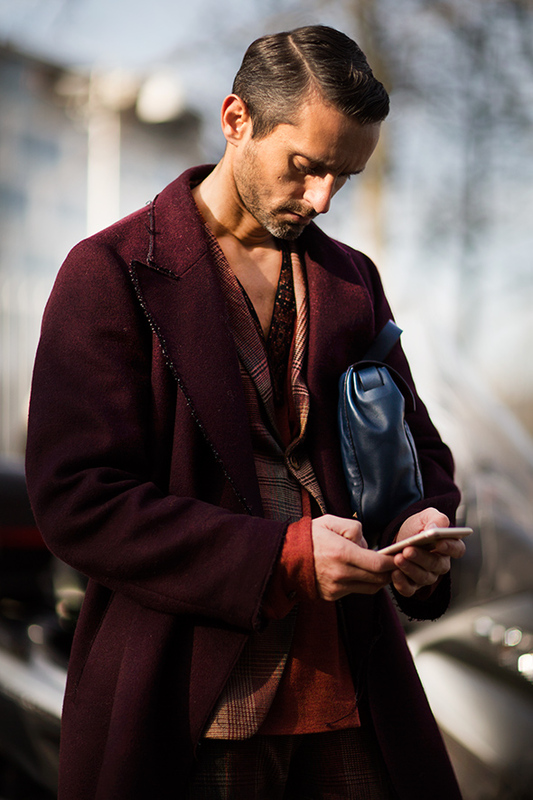 Sumptuous colours – but the open neck makes the jacket look like (another) dressing gown. Yeah, I get you… I am impressed with this look, nevertheless. Perhaps if we could see his head to toe look it would be less so? There is some enjoyable burgundy happening at present. It’s his layering of textures and colours that attracts me; they look beautiful, eleant and comfortable. And this man is rather gorgeous. …. ps this (dressing gown) jacket would look great with the bordeaux fluffy Birkenstocks, no? This photo is actually the same gentleman who was wearing the slippers in the photo from a few days ago. Thank you for reply. This gentleman obviously understands comfort! That’s very attractive. Hahaha! I didn’t realize it was the same gentleman, but I had the same thought as Tallulah. What great combo of patterns and colors. Stunning, the tones, texture and pattern mix is beautiful. Wonderful. Quoting Phoebe from Friends, “Well done god” ! this is perfect. I’d like to believe that it did not take more than 5 minutes from stepping out of the shower to closing the door behind him. The mix of colors is so great any others than ever I have seen pictures in this blog. Of course, the layer styling is also good!! I really want to try it somedays. And the most thing I like this scene is the moment when the model is taken a picture. Wouaw un style élégant, un visage de chérubin mais qui reste masculin . I tend to wait weeks, sometimes even months, to binge on the color and culture that shines through in the sartorialist so I get an overload of inspiration. I am shocked at how many photos there are of people with phones. 66% just on this first page. Some of the intrigue of the individuals captured is lost, perhaps because they themselves weren’t even enraptured by their surroundings and present in the moment.